Giving your attendees a custom mobile experience has never been easier. Or as powerful. The Fan Guru App is the hub for powerful engagements between your attendees, exhibitors, guests and management. Attendees can create their own custom experience of your event - before the show begins. Bring together all your attendee engagements across multiple platforms to capture the pulse of your event in real-time. Send messages to your attendees automatically or with logic based on changes or scheduled announcements. Bring exciting new digital engagements to your event with our built-in Augmented Reality viewer. 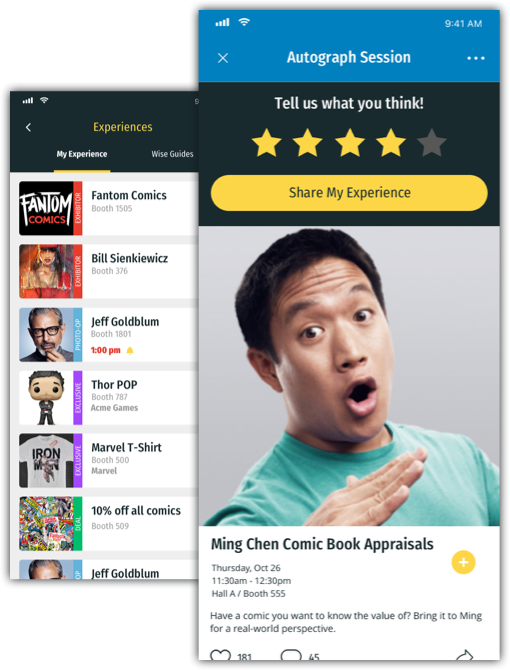 Our mobile app gives you the tools you need to better understand what your attendees are interested in - and what you can do better by them! Get ratings on all of your event activities, guests & exhibitors for a better understanding of what’s working and what could be improved. Find out what attendees are truly interested in as they build their schedule and favorite guests and exhibitors. Eventology's FAN GURU APP is powered by our BACKSTAGE toolkit which includes everything you need to create, manage and monetize your event. We’d love to show you how our mobile app can bring more insight, excitement and engagement to your next event.